Bethlehem Trading Company Ltd operates The Uniform Shop as a wholly owned subsidiary of the Christian Education Trust. It stocks a full range of new and some second-hand uniform items, accessories and school bags for students of Bethlehem College. Shoes are not included. 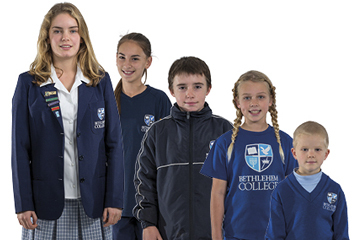 Information regarding the correct uniform can be found on the Uniform Shop section of the Bethlehem College website. The uniform shop seeks to return a small profit each year and from that donates funds to Bethlehem College’s Service Through Mission program.